APPSC Hall Ticket 2017 - Civil Assistant Surgeon (Specialists) Main Exam Hall Tickets Download. APPSC Civil Assistant Surgeons(Specialists) Mains Hall tickets 2017, APPSC Civil Assistant Surgeons(Specialists) Recruitment Hall tickets 2017. Apply Online from 4/10/2017, APPSC Civil Assistant Surgeons (Specialists) Recruitment 2017 Notification For 129 Posts Out; Application Starts @ Psc.ap.gov.in For October 4. APPSC Civil Assistant Surgeons 2017: APPSC has published the Civil Assistant Surgeons 2017 recruitment notification and applications are invited online from qualified candidates to the post of Civil Assistant Surgeons 2017 in the State of Andhra Pradesh. The proforma Application will be available on Commission’s Website (www.psc.ap.gov.in) from 04/10/2017 to 03/11/2017 is the last date for payment of fee up- to 11:59 mid night) for Civil Assistant Surgeons General Recruitment. 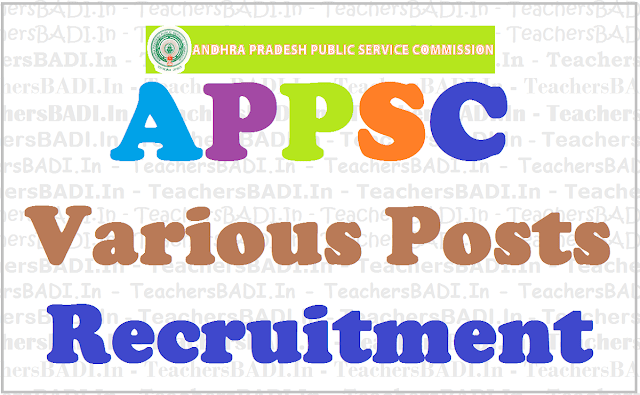 APPSC Civil Assistant Surgeons (Specialists) Recruitment 2017: Notification For 129 Posts Out; Application Starts @ Psc.ap.gov.in For October 4: Andhra Pradesh Public Service Commission has released the notification for applications for recruitment to the post of Civil Assistant Surgeons (Specialists) in AP Vaidya Vidhana Parishad. The online application will be available on Commission's website (www.psc.ap.gov.in )from October 4 to November 3 which will be the last date for payment of fee up- to 11:59 mid night. Before applying for the Civil Assistant Surgeons (Specialists) posts, an applicant will have to register his/her bio-data particulars through One Time Profile Registration (OTPR) on the Commission's Website viz., www.psc.ap.gov.in. Once applicant registers his/her particulars, a User ID is generated and sent to his/her registered mobile number and email ID. Applicants need to apply for the post using the OTPR User ID through Commission's website. i) Must Possess a M.B.B.S. Degree or an equivalent qualification as entered in the schedule to the Indian Medical Council Act, 1956 as subsequently amended. ii) Must be a permanent Registered Medical Practitioner within the meaning of the Law for the time being existing in the State. The APPSC will conduct Screening Test in Off-Line mode in case applicants exceed 25,000 in number and Main Examination in Online-mode for candidates selected in screening test. If the screening test is to be held in this Civil Assistant Surgeons (Specialists) recruitment, the date of screening test will be communicated through Commission's Website. The Main Examination of Civil Assistant Surgeons (Specialists) is likely to be held On-Line through computer based test on December 4 and 5 this year. There would be objective type questions which are to be answered on computer system. A general Mock Test facility for Civil Assistant Surgeons (Specialists) recruitment is available would be provided to the applicants to acquaint themselves with the computer based recruitment test. Applicant can visit the website and practice the answering pattern under MOCK TEST option available on main page of website www.psc.ap.gov.in. The Commission conducts Screening test in Off - Line mode in case applicants exceed 25,000 in number and main examination in On-Line mode for candidates selected in screening test. If the screening test is to be held, the date of screening test will be communicated through Commission’s Website. The Main Examination is likely to be held On-Line through computer based test on ....... FN & AN. There would be objective type questions which are to be answered on computer system. HALL TICKETS: Hall tickets can be downloaded 7 days before commencement of Examination. Hall tickets for Civil Assistant Surgeons (Specialists) would be available to download whenever the Commission uploaded them to its website. Intimation would be given through the website regarding downloaded of Hall Tickets. Submission of Online application starts from: 04-10-2017.